Breathing exercises are called Pranayamas, which means to control the Prana. Its techniques have been practiced for centuries by ardent students of Yoga in remote ashrams. Pranayama is a very important means for preventing and curing many ailments. By far the most important thing about good breathing is the Prana, or subtle energy of the vital breath. Control of the Prana leads to control of the mind. Categories: Health, Mind, Body, Spirit, Yoga. Tags: Yoga, health, Health through yoga, Meditation, Pranayama. The aim of this book is to bring the traditional knowledge of this great art to the common man. 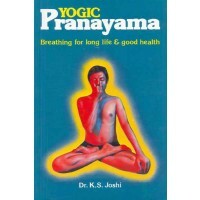 It is hoped that by reading this book the reader will be well equipped to keep diseases at bay by using the age-old techniques of Pranayama. Pranayama, the control of the breath, essentially entails the modification of our normal process of breathing. This book is an exhaustive look into the art of breathing. It is complete, detailed and technical. Yogic Pranayama is one of the most exhaustive, yet understandable book on breath, the physiology of breath, and the effects of proper breathing on the human organism written. The drawings and diagrams in the book are precise, simple and easy to understand.